I went to my favorite creek again and had another many fish day while using my Shimosuke Kiyotaki rod. 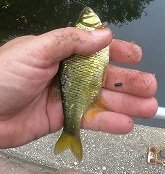 I was able to hook and land a variety of fish including, killies, sunfish and a few golden shiners, the smallest and largest of which I've posted a picture of. This golden shiner put up a good fight and the rod handled the fish beautifully. The small killie put a good bend in the rod and finally came to my hand with ease. I'm amazed at how soft this rod is and the control that I have with it. A few people stopped to see how I was doing and asked about the rod and were in disbelief that I was after the smallest fish that I could hook and land. I let them know that anyone can catch a big fish but it takes real skill to catch a small fish. I showed them the rod and the Owner smallest hooks that I was using and most of them walked away shaking their heads in disbelief. I don't think I converted anyone which is a good thing, after all it's a small creek and I don't want it to get to crowded. It's all about matching the rod to the quarry! Micro-fishing with a super-sensitive, ultralight tenkara rod opens up a whole new world of angling. Thanks for sharing the pictures. I have found fishing for micro fish to be very relaxing. Nice pictures. I usually catch very small regular fish so by the strict definition they are not micros. I do want to do a couple of specific trips for sculpins that are in our area. I been called nuts too, but as John said, if you match the equipment it is fun.